Abstract Painting - "What the moon has always meant"
I've finally done it! I've got paintings on my website!! I've only got prints available so far, the originals will be coming soon!! My first release is six original paintings done by yours truly. I've been painting for a few years now and drawing for even longer. I've experimented with multiple mediums, oil, acrylic and even encaustic briefly, and find myself coming back to oil, usually. I love the luscious buttery consistency of oil, and I even like the smell. Now, I'm a solvent-free painter, which means I don't use mineral spirits etc, so my studio smells way better than the average oil painter! So don't judge me too harshly when I say I love the smell of oil paints!! Close up details of green abstract painting - "Your heart with me"
My painting style is a little different than what they teach you in school - though I've taken plenty of classical training and can paint in the traditional ways, I mostly don't(I get bored with under-paintings and glazing!). I paint solvent free, and I usually don't use a brush, preferring my fingers and other random tools. I also often don't use a palette when painting. I simply mix the paints directly on the canvas. When in university, I sometimes felt like I needed to tell beginner painters to ignore what I'm doing and follow what their instructor says instead. Learn the rules before you break them, and all that! 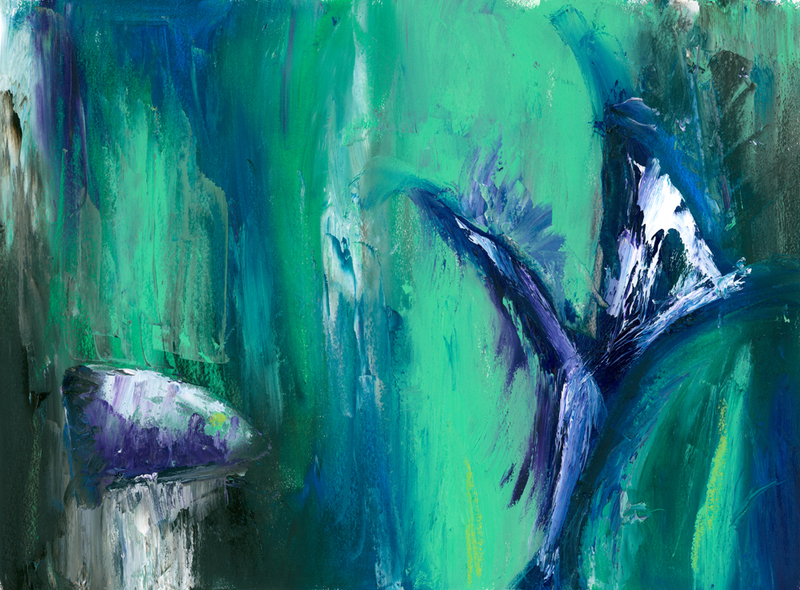 Abstract painting in green - "The sun will sing"
New originals and prints come soon. Hello! How are you on this lovely afternoon(or whenever it is where and when you are reading this!)? Actually, the weather here is quite gloomy and probably going to rain soon, so maybe I shouldn't call it lovely? But, I'm in a good mood, so I'll call it lovely! I've been dropping hints here and there, on Instagram and Facebook, and even here on the blog in my Changes post... Something is coming... Hints about something coming soon. Maybe they've been a bit more than hints, though. As I've said they painting are coming soon, and well, that is the whole announcement not just a hint! 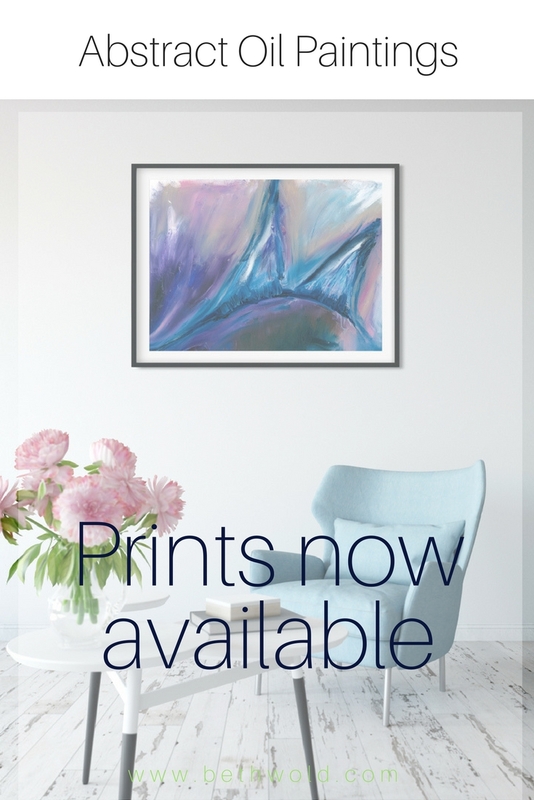 I've been painting for a few years, and drawing even longer than that, and I've finally reached a place where I've decided to start offering some of my paintings as both originals and prints. I'm both nervous and excited about the prospect, and as soon as I have a date for when they'll be available(it will be this month!) I would be letting you know, right here on the blog. I've got a couple of sneak peeks of the first collection that will be available, right here in this post, and also you can follow me on Instagram for more sneak peeks. My style of painting is abstract expressionism to a certain extent. I do tend to paint how I feel rather than a sketched and planned out from the begging painting. All of my paintings are full of thick texture and lots of delicious paint(not that you would eat them, but just that I think thick paint is beautiful!). Here's up close details of one of the paintings that is coming soon. Subscribers to my email list will be notified 24 hours before they are available to everyone else. If you are interested in owning an original, you should definitely sign up to that newsletter as you'll get a chance to get an orginal before they are available to everyone else! Check out the auqua sign up box below! Sign up to be the first to know about new work! So I haven't been doing a lot of photography lately(though I do have new stuff from Ireland last year that I will post soon). I have, however, been working on painting quite a bit in the last two years. Unfortunately, I have been in a bit of a frustrating slump in the last month or so - basically hating everything I worked on. Finally, I made something that I'm halfway happy with. Day 1. First I painted the background with acrylic paint. A lot of purple and tan. After that dried, I spent some time studying it while turning it upside down, 90 degrees, etc. I've been trying to exercise the ability to see shapes or picture in my abstract backgrounds - ideas that I want to bring forward into the final painting. I did see the partial image of a horse's jaw and mane hidden in the background, and decided that's what the painting would be(sorry, I didn't take a photo of this step - not sure if anyone else would've seen the horse or not). Next up browns and tans, trying to bring the horse to life. The jaw(mandible?) is wrong here, but sometimes I need to step back, photograph the work, to figure out what's not working. I ended the day here. Don't feel I'm out of the slump yet, but much happier than I'd been for a while with my paintings. Day 2. I had two goals on day two. I wanted to fix the proportion issues, and I wanted to brighten the painting(I just wasn't in the mood for browns and dark purples). Here's how I ended day two. I felt it was better... but still not happy with it, and still not feeling out of the "I hate everything I've done" slump. Day 3. I decided that part of my "I hate everything I've done" slump was that I just wasn't liking the look of acrylic paint. I missed the richness of oils. I really try to like acrylic - you can do some amazing things with it. One of my favorite things with acrylic is dripping paint - and I've yet to find a way to satisfactorily mimic that in oil. So I keep trying to like acrylic... and just keep coming back to oil. Anyway, due to my frustration with several of the paintings I've been working on, I decided to just play with this one a bit, and see what happened. First off, I used oil sticks with the lovely yellow, and some blue. I was starting to like it. Then I got my regular oils out, and put a glove on, and decided to "finger paint" - meaning I didn't use a brush, just my hands and occasionally a palate knife. I started with the background, greens, oranges, some cold wax, and even sand for texture. Didn't really like it, so I scraped most off at one point and started over. Then I moved to the horse. I used that gorgeous red color - a color I have previously avoided in paintings, as I normally don't like it. Here, this time, it spoke to me - made me happy! Some purples, blues, yellows, and greens later - I'm liking the horse, so I go back to the background. Finally, I'm done, as the paints too wet to do any more without making a mess. But, at this point I decided the edges were all to "sterile"... I don't know how else to describe it - I wanted it to be more free and less "perfect" so I just kinda smeared it with my hands - outward from the horse. Finally! I like something I'm working on, again. It's a nice feeling! I haven't decided if I'm done yet. Time will tell! So I mentioned earlier this year that I was going to be painting this year. I've actually made a few that I kind of like now, including the one above. (ignore the shadow at the middle top of the painting - it was being cast by the easel). So what do you think? Anybody else out there working in multiple mediums? Do you think it helps or hurts to work in other mediums than photography?